The story behind "Masai woman in Tanzania"
During the PlanetRace TV series we spent one week in Tanzania. Of course this is not enough, but that was part of the project: 5 continents in 5 weeks. Just 2 days on Kilimanjaro and a few days of safari including a great hot air balloon flight over the Serengeti made this one of the best work weeks ever! 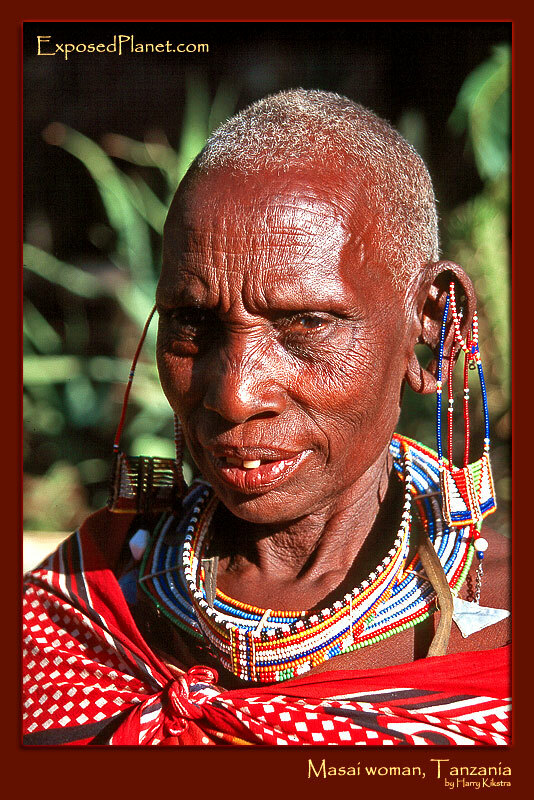 The Masai are semi-nomadic people that are divided equally between Kenya and Tanzania. Known as warriors, actually they are most reliant on cattle farming though the many National parks have made it less easy and many are now dependent on tourism. The men do little in daily life, it’s the women who build the houses, get wood, make food and raise the children. They are recognizable by the colourful decorations, as shown in this image of an elderly woman selling necklaces at Mwanga, the ground border between Kenya and Tanzania. She was not quite sure if she wanted me to take a photo, but trusted that I would buy some of her wonderful jewelry, which I did..
Scanned Provia 100 slide, shot with Eos 3 in November 2003. Voted Favorite on Moodymonday for Feminine, thanks for voting!